As mentioned in Part I, with a control system and interface system almost identical to that of a Fuji X-T2, getting up to speed with using the GFX was a piece of cake. I chose the 32–64mm ƒ/2 lens because, with its 25–51mm equivalent focal length ([sic] per Fuji), I thought it would be the most versatile lens for getting a feel for the camera for the different types of photography I wanted to do with it. I put the GFX the with 32–64mm lens in my Think Tank Retro 7 camera bag and headed out for some local landscape photography. I drove over one early evening to Norris Canyon Road, as it was close by and was rural enough to get a sense for using the GFX for landscape photography. Norris Canyon Road runs East-to-West and connects Castro Valley in Alameda County to San Ramon in Contra Costa County. It typifies the ranchland, rolling hills, and canyons that characterize the landscape in the East Bay Area. There's an abandoned ranch along the road where I often stop and photograph throughout the year. As mentioned in Part I, this camera and lens combination is surprisingly light compared to the big professional cameras I usually use, so handholding it for this type of photography posed virtually no problems at all. Seeing this photograph on the 27" 5K Retina iMac for the first time was when I started to understand what the GFX 50S brings to the table when it comes to image quality. The resolution, the ability of its dynamic range to hold detail from highlights to dark shadows, and the quality and gradation of tonal range, quite simply doesn’t look like anything I've seen before. Ming Thein wrote very eloquently about this unique look in his blog article "That medium format 'look': what is it? ", and that is what I was very much reminded of when I saw this image. "[The] camera's ability to simultaneously capture luminance variation across a large spread of brightness; the greater...difference between shadow and highlight clipping points." I then took the GFX with me to Sonoma Raceway for the Go Pro of Sonoma Indy Car race to test it out in a photojournalistic setting. I used the GFX exclusively for paddock and pit lane photographs, and here I found the GFX with the 32–64mm lens was right at home, and worked very well in this environment. So much so, in fact, that I kept doing a bit of a mental "double-take" when I thought about the fact I was using a medium format camera for this kind of work. Part of this was due to its lightness and ease of handling, but also its autofocus performance, responsiveness, and ergonomics. The 32–64mm range of focal lengths made it so easy to use and handle that the GFX just got completely out of the way and let me focus on my photography. It was particularly nice using the camera in pit lane—the focal length of the 32–64mm lens was perfect for this. One of the attributes I immediately noticed about the camera was its very accurate exposure metering as well as auto white balance. Most photos, including Fuji RAW (RAF) files required very little, if any editing, and that was usually limited to simply setting black point and white point. The camera's impressive dynamic range let me easily recover highlight or shadow detail in the situations that required it. the full file with these tiny web JPEGs. I tried using the GFX on continuous autofocus and drive at its max frame rate of 3.5 FPS for some racing action, and while my reach was a bit limited, I had surprisingly good success. The camera usually nailed focus on the first frame, and the images have that medium-format magic. There's a certain "something" to these images that is really wonderful. Lastly, I tried the GFX 50S for some architectural photography at San Jose City Hall, and came away very impressed. Once again, the camera's resolution, dynamic range, and, in particular, tonal gradations suited architectural work very well, and the original GFX RAF files converted to black and white beautifully. All three B&W architectural photos are of San Jose City Hall. While I found using the GFX 50S easy, responsive, and facile in use for everything from landscape to photojournalism to architectural work, what's more important is that the photographs I came away with were unerringly accurately exposed with near-perfect white balance, tons of dynamic range, and exemplary image quality. Color me impressed. I'll wrap up in Part III, yet to come, with my overall opinions and conclusions about the camera. Matt O'Brien: "Very useful review. Thanks for posting. Looking forward to part 3." John Krumm: "Looks like a lovely camera to me. Not the sort of thing I'm going to squeeze onto my Amazon card, but I still want it." Gordon Lewis: "Although unavoidable, it's truly a shame that you have to try to show what this camera and lens are capable of by displaying low-res JPEGs. It's like using a telephone receiver to listen to to a live performance by a symphony orchestra." We are about ready for a see change, see intended. M4/3 and DX/APS-C are more than good enough for many/most things. Real photographers, not online gurus, seem to love the new MF Mirrorless. So where does this leave FF DSLRS? About ten years ago I walked into Calumet's store in Santa Ana, CA, and the first thing out of the salesman mouth, after Hi Chuck, was what would I think of a Canon MFD? Now appears like a good time for Canon to skip FF Mirrorless and go directly to MF Mirrorless. Hoping to see one soon. Interestingly, I too rented a GFX and 32-64mm lens over a long weekend recently. Like Mr Scharf, I am a Fuji XT2 owner and found the menus almost identical except that the GFX has a three color histogram and better leveling indicators. I also went to locations I shoot often but did not do any handheld work. I'm certain some will use this camera handheld but I chose not to do so. I compared carefully made 12x16" prints from the GFX and my X T-2 (cropped on the XT2 to eliminate bias from the aspect ratio difference) and, in the end, at my usual print sizes, I felt the difference, was not worth it, especially given that the body costs roughly the same as TWO Nikon D850 bodies. The differences certainly can be seen on a monitor at 100% and with one's nose right in the print, but not so much at usual viewing distance. Unlike Mr Scharf and Ming Thein, I am unable to appreciate the "medium format look," though. I also compared the files to those made with my D800E, now sold, and they are pretty close in detail resolution. Like Lloyd Chambers, who is currently testing the D850, I am a detail oriented photographer, perhaps the term "detail freak," applies. To me, more resolution is almost always better, to paraphrase Mae West, "too much of a good thing is never enough." But, again, given the cost and currently limited lens selection (sure to improve but I'm not getting any younger), I decided against purchasing this lovely camera. I'll be interested in others' thoughts. I believe the range of the 32-64mm lens (2x) is not 21-51mm 35mm equivalence, but more like 25.5mm-51mm which is also 2x. Good write up of the camera, though. "I chose the 32–64mm ƒ/2 lens because, with its 21–51mm equivalent focal length." 32-64 is a 1:2 ratio, 21-51 is not. What is the actual equivalent FL range? I would like to see the GFX 50S compared to the D850. If the D850 is 90-95% of the way to the GFX 50S that knocks the GFX out of the running IMHO. HCB said Sharpness is a bourgeois concept. Robert Capa's D-Day photos may not be sharp, but they sure do grab-you-by-the-throat. Whilst some surrealist dreams are sharper and more real than reality. Lots of tools available, pick what works for you. BTW, for me, a Canon crop camera, knocks both the Nikon D850 and Fujifilm GFX 50S out of the running. #Camera doesn't matter. Stephen / Mike, thank you for the review. I love the architectural Pictures. As you pointed out , it is impossible to make meaningful evaluations by viewing web pictures which is why your impressions as a working photographer are helpful. In the Track picture of Will Power, we see what appears in the JPEG to be a blown sky, and very dark backlit faces - typical for most cameras in that difficult setting (which I am sure is the reason you chose it). I'm guessing that it looks better on your display, is that the case? or would those areas be easily and believably recovered? I am on the fence about this camera. As others have pointed out current and coming FF cameras will probably get fairly close and have price, speed and focus advantages. But I have always believed that there is clearly a MF 'look' from when I Shot Hasselblad along side 35m m, especially with large prints. How much of that Fujifilm packs into cropped MF format is something I am interested in. You are clearly an experienced photographer, so I found your description of the first image's wow factor helpful. B&W can be a good way to see that smoothness and 'effortless diferentiation' from tone to tone that can make a really great print. @ Eric Rose: On what basis would you want that comparison with the new Nikon? “Image quality”? Features / usability for specific tasks? I’ve never even touched a Nikon camera but can say with 110% certainty that it will easily beat the GFX 50s in terms of all-around value, versatility, and performance for the vast majority of photography activities. The dslr is largely a perfected bit of equipment, with the newest Nikon reportedly being at the top of that mountain. In my view, the GFX 50s should probably not even be considered “in the running” against a top-of-the-line dslr for most folks. ”Bear in mind you're not seeing anything like the full file with these tiny web JPEGs.” That times 10! It’s impossible to show the marginal, but often remarkable, differences between these medium format sensors and smaller cameras on any internet page or browser. There is nothing in Stephen’s excellent, varied images that even hint at it here. It’s not until you make a larger print that these big sensor cameras really pull away from the pack. Will it make me a better photographer? Well, no, probably not. Sometimes a big change in a camera system can make you a better photographer. For example, since switching to a Fuji X-T2 from a camera that almost had to be used on a tripod, I’ve made different kinds of images, and more images. But I don’t think adding a Fuji GFX 56S will have the same result, in large part, paradoxically, because it is so similar to the X-T2 in terms of handling (light weight, similar control set, etc.). Can it make files that lead to better prints? This is more of an open question. For someone who makes huge prints, perhaps it can. But I think they’d have to be really huge to notice much of a difference. For instance, I doubt there’d be much actual “better” in a 16”x24” print made with the GFX 50S compared to my X-T2. In comparing 16”x24” prints of the exact same subject using comparable lenses made with a 36MP Sony A7R sensor versus a Fuji X-T2 sensor, the extra pixels from the A7R didn’t add significantly to the quality of the final print in my view (or the people I showed it to). Obviously if you make prints where you need this many pixels to get to your pixels per inch “floor” on a print, then yes, this could work for you. Does it make RAW files that produce better black and white tones? I only shoot for black and white these days, so this is a huge deal for me. I’ve read or heard this claim lots of times about various cameras (and even lenses). And I’ve chased down RAW files made with those cameras and lenses so I can see for myself. I haven’t done that yet with this camera, so it could be the first one I try where it truly does produce “better” black and white images…. That would be exciting, and a first for me. So far all the cameras and lenses I’ve used regularly have been able to produce RAW files that make the black and white images I’m working towards. And as a bonus question… Does it have the magical medium format look (and will that make my photographs better…)? Ming Thein is a terrific photographer and a really good writer, but that medium format look article that Stephen cited in his post was one of the few that I thought was a stretch. The GFX 50S sensor, at 43.8mm x 32.9mm, has an area around 58% of the smallest technically medium format film size (645). It gets worse for people like me who actually like the 3:2 aspect ratio. I look at lots of photographs, and I’m not seeing the magic from mini-medium format sensors. Your eye may well be better than mine. This is a good example what you deal with in shooting in these situations, so let me give you some context behind this shooting scenario from a photojournalistic context: At this time of year, the light at Sonoma Raceway has a "hard wash" to it that can make photography at this time of day, to say the least, rather "unflattering". 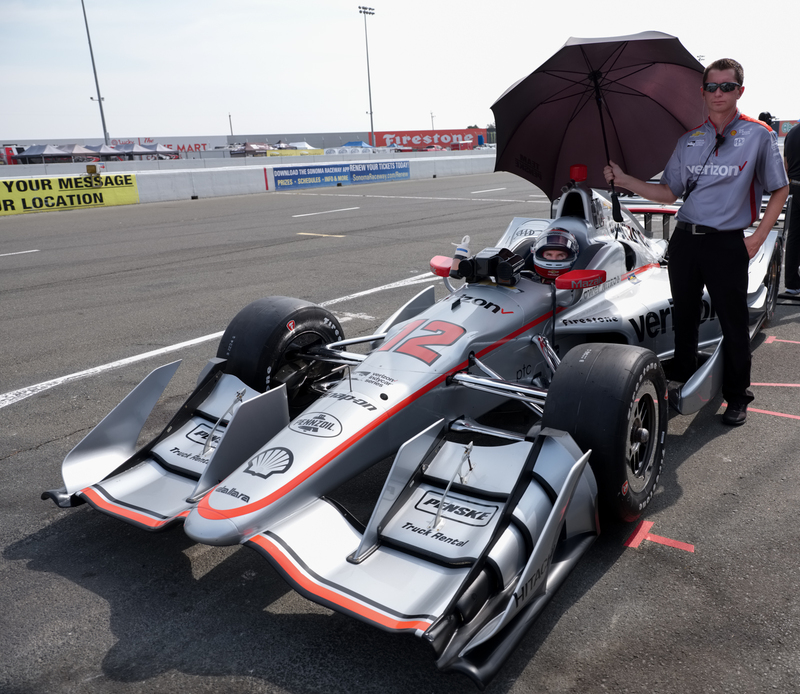 To make matters worse, Indy Car schedules this morning practice event at a time in the morning when the sun is directly behind pit lane, and the cars are very backlit by the strong summer sun. Furthermore, this morning time slot is the only session that Indy Car allows the photographers with "blue vests" to be "over the wall" and get into the pit boxes to photograph the cars in pit-lane during this practice session. Moreover, to be maximally safe, I always go to the front of pit lane and work my way along pit lane from front to back, directly into the backlit lighting, so I can be facing the cars, and keep my eye on the cars in their pit boxes, and much more importantly, cars entering and leaving their pit boxes (they tend to come in rather fast, and exit even faster!). In other words, I don't want to be in a situation where my back is turned to a racing car entering or exiting it's pit box! ;-) As you can imagine, photographing in this situation can be extremely dangerous; for example, you want to make sure your foot or ankle is never inside the loop of an air hose on the ground in the pit box that may be grabbed very quickly by a crew member and pull you to the ground. Regarding the photo itself: Yes, I could have easily pulled up the backlit shadows up and pulled down the highlights (just a touch for this photo). There is TON of editing headroom in the GFX images with which to pull up the shadows and pull down highlights. I've done some additional editing on the photograph to bring up the lighting on the crew member and area around the cockpit where Will is stting just to provide an example. In a normal situation, I would have popped some flash into this shot for fill, but I didn't have a flash for the Fuji GFX that provided TTL flash control. The nice thing about TOP is that it almost generates informed and interesting commentary. @Eric Brody: it's very likely one will not see any significant differences in print quality between an X-T2 and a GFX 50S when printing at 12" X 16". I have two very good friends that are critically acclaimed professional fine art photographers that shoot exclusively with a medium format Phase One digital, and their view and experience is that it's only when you print at 30" X 40", or minimally, at 24 x 36" that you start to see how MF files really pull ahead of APS-C or FF images with respect to print quality. The majority of their print sales are at these larger sizes, and having seen many of these remarkable and beautiful prints first-hand compared to similar-sized prints made from a FF camera, the advantages of MF are clearly visible. Ken's comment, "It’s not until you make a larger print that these big sensor cameras really pull away from the pack." is absolutely the case. @Ken Tanaka: "That times 10! It’s impossible to show the marginal, but often remarkable, differences between these medium format sensors and smaller cameras on any internet page or browser. There is nothing in Stephen’s excellent, varied images that even hint at it here." Thank your for your kind words, and truer words were never spoken. It was not until I opened up Norris Canyon Road on my large, 5K, profiled, high-resolution display that I really "got it". I think the first words out of my mouth were "Whoa. Okay, now I am beginning to understand what this "medium format thing" is all about." It's clearly a process of re-discovery of what photography has the potential to actually be. And, it's not just about specs, or resolution, or the size of the sensor, it's much more than that, most notably the interaction of MF lenses with the sensor, the sensor design, and the all-important imaging processor (the bit that eveyone forgets about) that plays a big role here. I will discuss these points in Part III. And yes, Ken, please, by all means, share your notes and experiences with us. I very much value your comments and insights, and look forward to your sharing your experiences with much interest. Stephen, the tonality of [i]Norris Canyon Road[/i] absolutely blows me away, even in the low resolution web JPG. I need to lock up my wallet. @Ken Ford: Thank for your kind words. If you send me your email address to scharfsj@ix.netcom.com, I will send you a larger image to view, if you like.